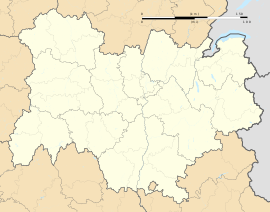 Randan is a commune in the Puy-de-Dôme department in Auvergne in central France. The place gives its name to Randanite, a soluble silica that occurs as fine earth near Randan and near Algiers. In the late 19th century the official composition of the dynamite at the Poudrerie nationale de Vonges and other French powder works was 75% nitroglycerin, 20.8% randanite, 3.8% Vierzon silica and 0.4% magnesium carbonate. Wikimedia Commons has media related to Randan. This page was last edited on 16 September 2017, at 12:00 (UTC).